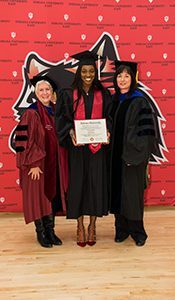 Sloane Stephens was presented with her Bachelor of Arts in Communication Studies degree at Indiana University East on Thursday, December 14, at the Student Events and Activities Center, located in Richmond, Indiana. IU East Chancellor Kathy Cruz-Uribe and Executive Director of Academic Affairs Michelle Malott present Sloane Stephens with her B.A. in Communication Studies degree. Stephens is one of 20 Women’s Tennis Association (WTA) players enrolled at IU East through an educational agreement between the campus and the women’s professional tennis organization. She is one of five WTA players to graduate under the agreement. Also graduating this December is Katalin Marosi with a Bachelor of Science in Psychology. IU East alumnae include Venus Williams, Alla Kudryavtseva and Irina Falconi. Stephens was presented with her diploma by IU East Chancellor Kathy Cruz-Uribe and Executive Vice Chancellor Michelle Malott. She is a December 2017 graduate and completed her last online class during finals week, December 5-14. Stephens enrolled at IU East in the summer of 2015. IU East and the Women’s Tennis Benefits Association have an agreement that establishes IU East as the primary provider for baccalaureate online degree completion programs for WTA players. The agreement provides the opportunity for players to professionally train and play tennis while completing their bachelor’s degree online. IU East’s online degree completion programs offer the high quality of an Indiana University degree to students throughout Indiana, nationally and internationally. IU East offers 14 options for students to complete their bachelor’s degree or certificate online. IU East Chancellor Kathryn Cruz-Uribe welcomed Stephens to campus and to the alumni family of more than 10,000. Stephens, who resides in Florida, traveled to Richmond for the degree presentation. While visiting IU East, Stephens toured the campus and participated in a presentation and Q&A with student-athletes in the Reid Health Wellness Zone. She also had an opportunity to meet members of the faculty, staff and community. During the Q&A with student-athletes, Stephens shared how she successfully combined being a student and a professional athlete. This year, Stephens won the U.S. Open, claiming her first Grand Slam title. She was voted as the 2017 WTA Comeback Player of the Year. In a little over a months’ time after returning from an 11-month injury layoff, she rose 942 spots from No.957 to No.15 in WTA rankings. 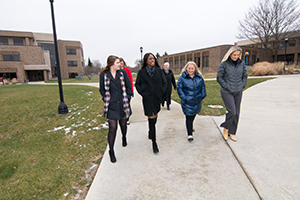 Sloane Stephens tours the IU East campus on Thursday with students, staff and the chancellor. Stephens earned a second-best year-end finish at No.13 in 2017 (one off career-high of No.12 in 2013). Lisa Grattan, Women’s Tennis Benefits Association (WTBA) Chair, shared in the congratulations. “Congratulations to Sloane for an amazing 2017! Not only did she return from injury and win the US Open Singles title, she has also completed her B.A. in Communications degree at IU East and is graduating just three months later, which is an example of the hard work and dedication that Sloane shows in all that she does. For more information about Stephen’s IU East experience, visit iue.edu/Sloane. The Women’s Tennis Benefits Association (WTBA) is a non-profit organization, established to promote and protect the common interests of all women tennis professionals (the “Members”) and to unite them in a single representative organization. The Organization’s primary activities are to administer and manage the retirement plan investments and other assets owned by or on behalf of the Members; to oversee the Member Health Insurance and Disability; and to offer “Transitions” Educational Programming. The WTA is the global leader in women’s professional sport with more than 2,500 players representing nearly 100 nations competing for a record $139 million in prize money. The 2017 WTA competitive season includes 55 events and four Grand Slams in 32 countries. In 2016, the WTA was watched by 408 million fans on television and digital channels around the world. The 2017 WTA competitive season concludes with the BNP Paribas WTA Finals Singapore presented by SC Global from October 22-29, 2017 and the Hengqin Life WTA Elite Trophy in Zhuhai, China from October 31-November 5, 2017.